At Diane W. Sherman, DMD, we believe that all patients deserve to enjoy their ideal smile. For some, a quick treatment with teeth whitening can be all it takes to transform dull or yellowing smiles. For others, achieving a beautiful smile can require a combination of cosmetic and restorative dental treatments. Regardless of your needs, our Encinitas dentist offers a wide range of solutions that are tailored to your unique smile. At their core, cosmetic dental treatments are designed to enhance the look of your smile. In recent years however, much of cosmetic dentistry has taken on a more restorative approach. Treatments like composite (tooth-colored) fillings and porcelain dental crowns not only add strength to damaged or broken teeth, but also provide an alternative to distracting metal crowns or silver fillings. While some treatments like teeth whitening and veneers are still more cosmetic than restorative, these treatments are made with compounds that improve the overall health of the smile. Cosmetic dentistry also has the important value of improving patients’ self-confidence. Often, individuals who feel their smile is not at its best tend to hide their teeth and avoid smiling altogether. This can leave new acquaintances with the wrong impression of who you are. By addressing your concerns with cosmetic dentistry, our Encinitas dentist can help you smile with confidence. Are you tired of the way your smile looks? Through a personalized cosmetic dentistry treatment plan, Dr. Diane Sherman can help you regain confidence in your smile’s appearance. 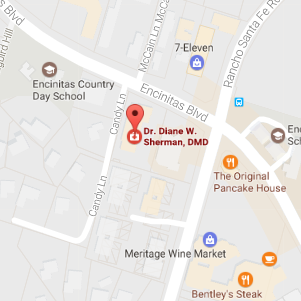 Call our Encinitas dentist today to schedule your consultation or complete the form on this page. We look forward to seeing you!